Cadillac’s newest advertisements for the 2019 XT4 have reached local television stations after a launch this past October. We praised the ads for their tone shift to something more positive and exciting after years of dramatic “Dare Greatly” spots. But, we missed something the first time around. We went back to view the ad and noticed the spot appears to house an Easter egg for the Cadillac Escala. At the 0:15 mark, a theater marquee comes into view. The top of the marquee reads “Escala.” Just to make sure this wasn’t on-scene footage, we Googled “Escala Theater,” and no such thing exists. Thus, we can only surmise the Cadillac advertising team pulled a sneaky on us. Typically, marquees preview what’s to come, and if Cadillac did indeed incorporate that into this XT4 ad, then we commend them. It’s clever, creative and asks more questions than it answers. Eagle-eyed viewers will also note the store front beneath the marquee reads “New Arrivals.” Were not conspiracy theorists, but it all seems more than coincidental. Nothing makes its way into a curated ad by accident. The last we heard of the Cadillac Escala, which debuted as a show car at the 2016 Pebble Beach Concours d’Elegance, General Motors had given the car a green light for production. A report from March claimed the car will be Cadillac’s flagship vehicle and arrive in 2021 based on GM’s Omega platform. Following the March report, former Cadillac President Johan de Nysschen seemed to confirm a flagship was in the cards, but said such a vehicle wouldn’t arrive until after 2022. De Nysschen long hinted at a Cadillac halo vehicle, but said it wouldn’t take the form of a traditional sedan. For what it’s worth, the Escala is a liftback with a hatch. 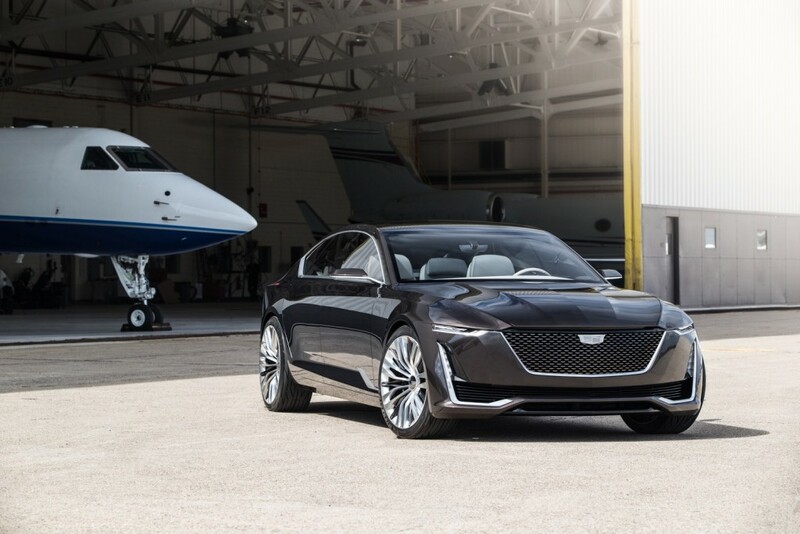 Fast-forward to comments made by newly installed Cadillac President Steve Carlisle, and he too imagined something different to sit atop the Cadillac lineup. He specifically focused on the potential for a flagship vehicle with an electric powertrain. We know the some of the first of GM’s 20 new electric cars by 2023 will, indeed, be Cadillacs. Carlisle also said such a car doesn’t need to adhere to the “CT/XT” nomenclature. Is it all coincidence? We don’t think so, but we have a few more years to see what the brand has up its sleeve as its product wave kicks into high gear. This is very clever. I actually noticed them throwing this in when I first watched the commercial a week or so ago. I thought it could be something but didn’t know for sure. I’m glad someone else confirmed it. Cadillac should do more fun stuff like this. Very entertaining. Yes, Escala Theater… where nothing is showing. LOL just, yes. I own a CTS and it’s the worst car I’ve ever had. Very unreliable, sits too low, too small overall really. It’s a shame. My mom’s VW is a better car. Very Cool. Now…..If we go on a full treasure hunt…..we can see that the ad is on 8th Street….and since it definitely can’t be 8 years for the Escala…..it must mean either 8 quarters or the 8th day of the year. If it were the 8th day of the year, that would be more than 10 days before the Detroit Auto show ….soooooooo……. Ok, that was fun. Very cool. I hope it does end up being electric….or having an electric version and definitely the interior from the model. Google Street View “810 South Broadway, Los Angeles, CA 90014”. And never ask me how I spent the last half hour or so of my Friday night. GM will screw it up, they always do. Clever Cadillac, this play on names. Too bad nothing is playing at the Escala theater though. It should have said “Coming Soon” or something up there. work an race . I see favorably cadillac art or ct4 in nascar trim wir v6 with 450 and 500 hp. May be the fans of nascar will like………………..